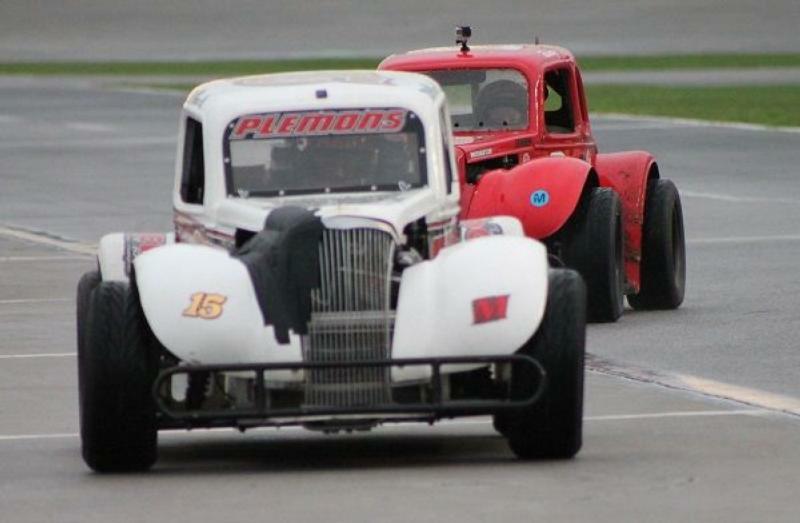 A wet damp track didn't wash out all activity at Atlanta Motor Speedway as Legends cars took to the track for week five action of Thursday Thunder presented by Papa John's Pizza. Light drizzle and a damp track did prevent bandolero cars from turning a lap. Rolling off the grid first, Bill Plemons Jr. continued his dominance in the Masters Division with his 4th consecutive victory to take a commanding lead in the points standings at the half way point of the season. Plemons started on the pole and drove away from the field on a wet slick track. "Its a different deal when the track is all wet but it was equally unfair to everybody," said Plemons in Victory Lane. "After I've been beat on this weather in the past, I started to watch the road course cars and they'd 'rew, bonk, boing' as they gear down in the corner and the gear would just turn it. Then, as soon as you hit the straightaways, just hammer it and go." Robbie Woodall of McDonough struggled throughout the feature and finishing ninth as he slipped and fish-tailed through the turns. He remains in second in the points standings despite posting his worst finish of the season. Mark Swan of Athens kept a steady hand and finished second while Tony Armbruster of Covington finished third. In the Semi Pro Division, Johnston, IA native Sammy Smith earned the feature victory as he held off both Davis Rochester of Lebanon, TN and Nick Woodall of McDonough. After Smith opened up three car length lead on the field over the first 13 laps, a host of back markers got tangled up on the slick track and brought out a caution. On the ensuing restart the trio of Smith, Rochster and Woodall exchanged the lead a handful of times before another pile up at the back of the pack brought out the caution as the leaders headed for the white flag. Smith darted out to the lead on the restart and held off Rochester and Woodall on the two lap shoutout to claim the victory. In the VP Race Fuels Pro division feature, Jensen Jorgenson survived a late race restart to post the victory. "I knew some funny business was going to happen in turn one on that restart," said Jorgensen. "I expected the bump, but I was pushed a little harder than I thought up into Slate and messed my car up and I was limping for those final two laps." Jorgensen went door to door with Rafe Slate and Hunter Johnson on the final restart of the night with two laps reaming as the trio bumped and banged through turns one and two. Jorgenson had the advantage with the inside line and drove back to lead and out drove the challengers over the final lap and a half to claim the checkered flag. Jorgeneson had opened up a three second lead on the field with seven laps to go, but the late race caution bunched up the field and set up the two lap shootout for the checkered flag. The final feature of the night ended under caution with Ashton Whitener of Monticello dancing through a pile up in turn two as time expired in a caution filled Associates Group Young Lions race to claim her first career Thursday Thunder feature victory. The top three drivers in the division point standings were all involved an incidents during the race pushing them out of contention for the win. Division leader Ryan Rackley and second place Lawson Ingold got together on lap six while Blaze Crawford brought out the caution on lap nine. Whitener, in her first full season behind the wheel of a Legends car, snagged the victory as she avoided a pile up in turn two on the final restart of the night with two laps remaing. With the rest of the field crashing behind her, Whitener out paced Annabelle Mowish, who finished second, and Audrie Ruark in third for the win. The 2018 season continues with week 6 action next Thursday, July 5 and will run each Thursday night through July 26, before wrapping up with a special-edition Saturday Championship Night on Aug. 4. Below is a complete list of Week 5 winners while Bandolero cars will make up their week five action at a later date.